The one thing you realize living within the Sunshine Coast region, there’s a strong feeling of community. You see it on the coast and especially up into the hinterland, small towns are very big on getting together to nurture and celebrate their chosen lifestyle. 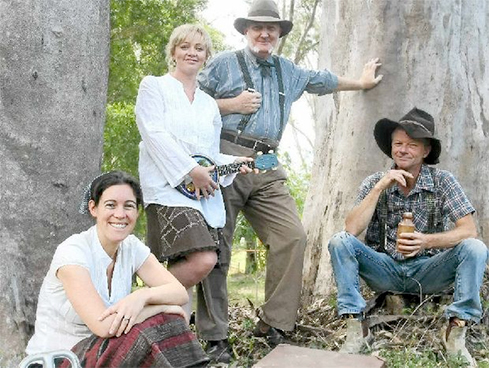 Right now one of the Sunshine Coast’s most picturesque regions, the Glasshouse Mountains is holding their Glasshouse Country Festival, it runs until the 26th of October. Yet again it’s a celebration of the unique arts, culture, heritage and environment of Glasshouse Country. Right across to the foothills of the Blackall Ranges, spanning from Beerburrum to Glenview you’ll find many opportunities to get a feel for the often vibrant, community atmosphere over its ten days of events and activities. The festival program began on the 17th with the Beerwah Celebration where a festival was held along its upgraded main street. In fact, it was the official opening of the newly refurbished strip and featured stalls, a ‘kids zone’ and live music from local schools, the Super Dads and was headlined by the Cheap Fakes. This Sunday, the 25th, the Australian Railway Historical Society Queensland Division will be offering its Sunshine Express Rail Tours on their very popular steam train, the BB 18¼ locomotive 1089 and the 1910 built heritage carriages steaming through the forests and fields. Carriage loads of visitors from Brisbane will also be rolling northward to meet up with the locals. You can take a step back in time aboard a true steam train riding the rails before stopping in Glass House Mountains to hear about local history, Landsborough for the WW1 themed Landsborough Day festivities and Mooloolah for the Fun Fair with live music and a kids market. GLASS HOUSE MOUNTAINS to MOOLOOLAH and return. Departs 10.55am – Returns 1.23pm. FARES: Adults $30; Pensioners $20; Children $15. Includes 1-hour stop at Mooloolah Fun Fair. LANDSBOROUGH to GLASS HOUSE MOUNTAINS and return. Departs 1.03pm – Returns 2.21pm. FARES: Adults $20; Pensioners $15; Children $10. Includes half hour stop for talk with local knowledge expert, Ivon Northgate, at Glass House Mountains. BRISBANE to MOOLOOLAH and return. Includes activity stops Glass House Mountains, Mooloolah and Landsborough. Landsborough Day will be full of fun with WW1 themed displays, theatrical performances, Centenary displays of the Qld Police Service and Red Cross, music, markets and more. Bookings are necessary and local tickets will be on sale at the Landsborough Museum, at number 4 Maleny St, Landsborough. Open 9am – 2.30pm, Wed, Thurs, Fri and Sundays plus Saturday 25th October. Sunshine Express Rail Tours look forward to welcoming you aboard. Bookings can also be made by phone on 07 3252 1759 between 9am and 3pm Tuesday to Thursdays. Be sure to book early! Over both days, this weekend will also see a local area art Exhibition and Workshop, to be held at the Glasshouse Scout Hall from 10am till 4pm. This exhibition features a variety of art from the studios of artists who regularly open their studios to the public whilst working throughout Glasshouse Country. Hosted by the Glasshouse Country Arts Trail. The Scout Hall is located on Steve Irwin Way, opposite the Sports Club. It only costs a gold coin entry. A variety of art workshops will be held including: painting, lino block print making, mixed media/collage, felt making, cyanotype print making, “Kimono Kanzashi” Japanese flower brooch making and “taking photos better photos and how to edit them”. Hosted by the Glasshouse Country Arts Trail. Half-day workshops cost $24 per person plus materials (10am-1pm or 1pm-4pm). Bookings are essential so here’s the contact Neville Field on 0438 525 749 or neville@artatglasshouse.com.au. There’s loads more to be found throughout the 10 days of events, so don’t be a stranger within your own community, there’s fun to be had in them there hills! 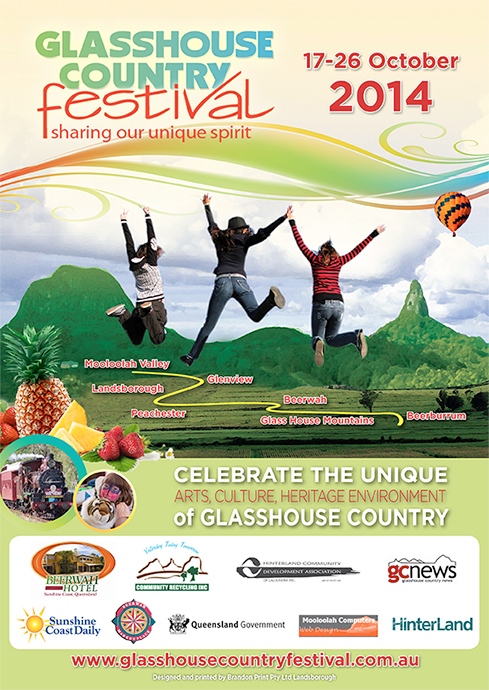 Check out the Glasshouse Country Festival website for more details and timings.